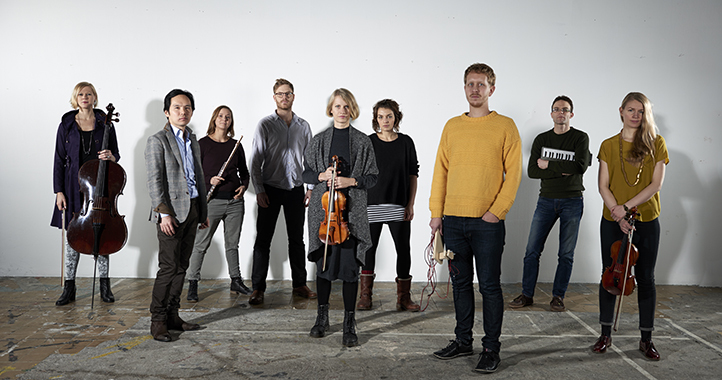 The piece corps étrangers (for six musicians and computer) was written by Joakim Sandgren specifically for Mimitabu and is the third and last piece for sextet and tape in a bigger cycle for fifteen pieces written for solo, trio, sextet and nonet formations and four channel tape. This piece was commissioned by Mimitabu with support from the Swedish Arts Council. The premiere takes place at Atalante, October 3rd from 18.00. The basis for this piece is a field recording taken at the North Puyallup River Bridge, a small wooden footbridge overlooking the north fork of the Puyallup River in Washington State. Reflections off the rock walls of the narrow river canyon and from the bridge above cause certain frequencies to pop out. While these are amplified in the mix, additional frequencies that our ears might add are played by the ensemble. The premiere takes place at Kronhuset as part of Göteborg Sounds on September 29th. The musical material in Lampstands is divided into two groups: a melody performed by a duet, and an accompanying trio that imitates the melody in stretched time. The text is a composite of two biblical passages. Taken out of context, they are almost comically redundant lists of household items. The premiere takes place at Kronhuset as part of Göteborg Sounds on September 29th. A Shrinking Emptiness is as much concert as it is an installation and a lecture. An audiovisual landscape, a temporary room that the listener is welcomed into. A Shrinking Emptiness is a project created, staged and performed by Gothenburg based composers and musicians Anders Hultqvist, Stefan Östersjö, Ole Lützow-Holm, Halla Steinunn Stefánsdottir, Jörgen Dahlqvist, Jakob Riis, Gunnar D Hansson and contemporary music ensemble Mimitabu. A Shrinking Emptiness takes place at Atalante on October 2nd from 19.00.